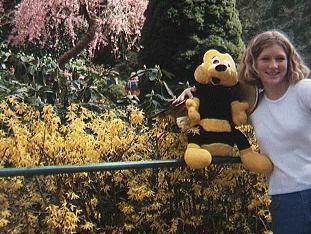 Benny the Bee was hanging around an arcade at King's Island until Ben C. of Cincinnati threw the ball that rescued Benny the Bee from his carnivalous life. Benny now travels with his new family, a nice Canadian family, and gets to visit with his six legged sisters very regularly! Follow Benny on these pages as he serves as an International Ambassador for Peace, Harmony, and the Pursuit of Beekeeping!! Benny the Bee, in addition to bee-ing an unpaid Ambassador for Apiculture, has to make a living! His sisters prepare nice comb honey like this for the e-mail market. For more information on comb honey, jump to the Comb Honey Page. 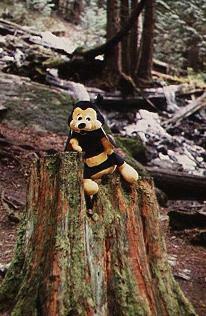 Benny the Bee Visits Vancouver Island! April 1, 1996. 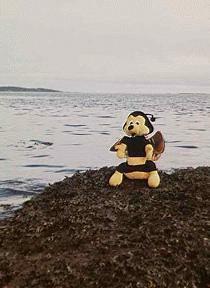 Benny the Bee sets sail for Canada's most beautiful island! Vancouver Island is about a one and a half hour ferry boat ride away from British Columbia's rugged Pacific coast. Each of the huge ferries handle several hundred cars, trucks, and passengers. 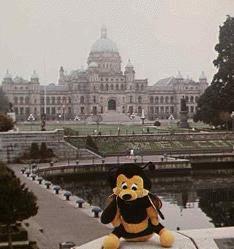 Benny the Bee was required to obtain diplomatic exemption to travel to Vancouver Island. The Gulf Islands are remote and isolated, so British Columbia's Agriculture Department forbids the movement of bees from the mainland out to the islands. This is to help keep out pests that may travel with the bees. Benny was allowed entry on condition that he shower regularly and not mingle with the local bees. Vancouver Island is incredibly mild. 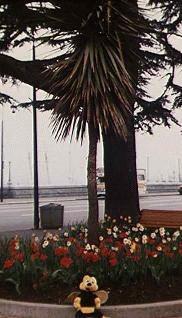 Although the winters tend to be wet, it seldom freezes here and palm trees such as this one are not uncommon! Benny is exploring the gorgeous scenery of Vancouver Island. Most bees don't get to see as many types of flowers in their entire four week life-time! 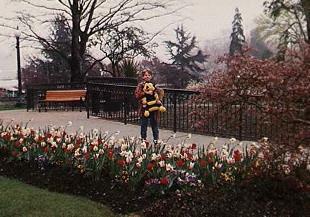 This photo with Benny and one of his sisters was taken at Butchard Gardens, a fifty acre horticultural paradise and botanical gardens near Victoria. The spring season's flowers include tulips and daffodils, many varieties of magnolia, and some stuff even Benny didn't recognize. It is typical for flowers to reach this state of bloom in March or April on Vancouver Island. This puts spring at about the same time as North Carolina in the states. Vancouver Island and the Gulf Islands of British Columbia are home to the Haida people. The totem pole, perhaps the best known art form of the west coast natives is ubiquitous. These cultural icons celebrate history and traditional stories. British Columbia's meeting hall for its elected representatives, at the Inner Harbour, downtown Victoria. Victoria and immediate 'burbs have about a quarter million folks forming their hive. The Inner Harbour, directly behind the big yellow bee, has launches for small passenger ferries, personal yachts, and guided whale-watching tours. Victoria, British Columbia, has a long tradition as a relaxing and easy-going vacation spot. 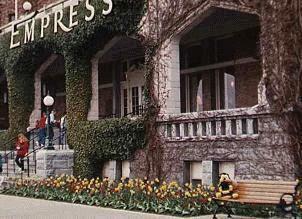 High tea is still very much in fashion at the elegant Empress Hotel at the Inner Harbour. Vancouver Island may have high society, but it also has its rugged rain forests with hundreds of kilometres of trails and roads to explore. Moss, ferns, and giant conifers turn the scenery into a mystical fungal wonderland. Benny the Bee finds that the world runs out of nectar-bearing species at the water's edge! Want to learn more about Butchard Gardens, Victoria, British Columbia, or Canada? Try these links!